At the end of the 1930's, the Electro-Motive Company (later Electro-Motive Division of General Motors) constructed the first streamlined diesel-electric cab locomotives (or "covered wagons" as they were called in the US) which were to change the picture of railroads radically in the following decades. What we may now regard as a classical approach in locomotive construction, was in those times a revolutionary innovation in many concerns. The streamlined engineer's cab with its typical "nose", hitherto little considered in locomotive design, is not only aesthetically appealing, but also provides excellent protection for the crew in case of a collision. The smooth surface was also a rare sight on the railroads of that time, as was the presence of swiveling power trucks with separate traction motors as opposed to driven axles held in a rigid frame, flanked by unpowered leading and trailing trucks or axles. Incorporating these  and other  innovations, EMC presented a family of streamlined locomotives; in 1937, a twin-engined six-axle type (the "E" series) for passenger service, the unique four-axle lightweight "TA" for the Rock Island RR, and in 1939, a multiple-unit arrangement of single-engine four-axle units (the "F" series) for freight service, the latter also introducing EMC's new 567 prime mover which became one of the most widespread engines used in locomotives, but also elsewhere. While the E-units did well in passenger service, the better part of mainline dieselization is attributed to the F-units which were built at EMD's La Grange, Illinois plant by the thousands, standardization and mass production being an important factor for the F unit's victory. Meanwhile, the F-units often performed in passenger service and were preferred over the E's especially in mountaineous areas. To provide steam for train heating, these passenger F's were fitted with a steam generator as well. Later, special types were built for passenger service; the FP7 and FP9 had a lengthened carbody to accommodate an additional water tank for the steam generator. The FL9, another special construction, had a three-axle rear truck to provide place for a third-rail pickup contact which enabled these dual-power locomotives to use the third-rail electric system in the New York area. As the F-units grew old, they were replaced on most main lines by road-switchers of the hood unit design. Sooner or later, many F's, if not scrapped or traded-in, ended up on shortlines, museums and in switching service; their full-width carbody not expressly designed for the latter purpose. This shortcoming was one of the reasons that moved ATSF to rebuild some F's to a hood unit at their Cleburne shops, known as CF7 which certainly deprived the locomotives of their elegant appearance but ensured them additional decades of service at ATSF, later on various shortlines. Encouraged by EMD's success, and last but not least freed from war production restrictions, other manufacturers also appeared with similar cab unit constructions, such as ALCo, following the DL109 with the PA/PB and FA/FB (and their famous export model, the DL500); the "Erie-builts" and the C-liners of Fairbanks-Morse and Baldwin's freight and passenger "sharknoses". After parting with ALCo, even GE built an experimental four-unit set (UM20B) to probe the market and a similar external design was later applied to New South Wales' ALCo-powered 43 class. However, none of these cab units were, with respect to the number of units built, as successful as EMD, and GE's example showed that by the beginning of the 1960's, the reign of the cab unit drew close to its decline; railways were rather interested in the versatile hood design of road switchers. By the end of the 1940's, the F-unit was regarded as a popular and well-proven design, and beside those in Canada and Mexico, railroads on other continents were also considering the acquisition of EMD motive power for their envisaged dieselization projects. The only genuine F-units, however, which made it outside America, were the FP7/9's built for Saudi-Arabia and some sporadic F's acquired second-hand for service in Australia. The first modified "export model" cab unit was the Australian ML1 built in 1951 by Clyde Engineering of Granville, NSW (EMD model designation A16A, the first "A" standing for the export cab unit, the "16" standing for the 16-cylinder prime mover). This was in essence a derivative of the North American F-unit with a lowered carbody and three-axle trucks to suit Australian clearance and axle load requirements. The ML1 was initially delivered to Commonwealth Railways (later Australian National) as the GM series, but also other railroads placed orders for similar locomotives. One of the most unique models was Victorian Railways' B class (ML2, GM designation AA16C) which received a streamlined engineer's cab at each end so that turning the locomotives was no more necessary. Other locomotives, such as NSW's 421 class, had one streamlined cab at one end and a flat cab at the opposite end, or a simplified hostler's stand as for the VR S class or the NSW 42 class. Most Clyde cab units kept the original coolers with electric fans, although Clyde offered the option of mechanically driven coolers from the 1960's on. Many of the Clyde-GM's were also equipped with dynamic brakes whose arrangement underwent gradual improvement over the years. Clyde Engineering also produced cab units for export: 9 units of the single-cab ML3 model went to Pakistan. It should be also mentioned that the "bulldog nose" of these locomotives earned such high esteem that even in the era of moderately streamlined locomotives (often referred to as "flying bricks"), Commonwealth Railways ordered a custom-built series of locomotives (the CL class, later CLF and CLP) which had the "classic" F-unit nose ahead of the boxy carbody. Most Australian EMD cab units had a respectable service record and aside from preserved units, many of them are still in regular service. A fine example for this outstanding longevity are VR's B and S classes (Clyde ML2 and A7). Several units, the B class approaching 50 years of age, the S class somewhat less, were sold to West Coast Railway, still giving excellent service, while some of the B class were remanufactured with new EMD 645 prime movers and remained in service at VR as the A class. On the other hand, the Clyde-built locomotives of Pakistan have now been apparently out of service for a while and unfortunately, no preserved units are known. By the 1950's, many European railroads had a chance to ascertain themselves with the performance and the reliability of EMD motive power, thanks to EMD's G12 demonstrator 7707 and the EMD-engined MRS-1 1818, a 16-567-powered locomotive built for "Military Railway Service". Driven by the demand for GM motive power, Nydqvist och Holm AB (NOHAB) of Trollhättan, Sweden produced the first plans for an EMD-engined cab unit, basically Clyde's ML2 design modified to meet European clearance standards. This modification resulted in a more rounded roof, changing the shape of the cab windshields and lowering the nose. Also, a pair of ditch lights was added, at that time already standard in Europe, while in America it was introduced only several decades later. 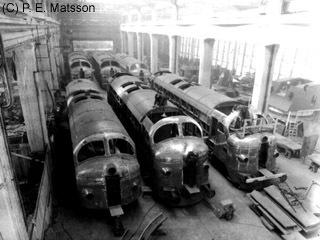 In 1954, an initial batch of four AA16 locomotives (axle arrangement A1A'A1A') was delivered to DSB (Danish State Railways) who also played an important role in the design of this European double-cab export model. These four units became DSB MY 11011104, later to be followed by other 55 locomotives of the class. At the same time, a demonstrator was also built which roamed Europe in hope for further orders. Although the demonstrator even made it to Turkey, the only resulting order was placed by NSB (Norwegian State Railways), where this particular locomotive became Di3.602 in 1957, the first member of a class of 35 locomotives, most of them of Co'Co' axle arrangement. Expecting a contract with VR (Finnish State Railways), NOHAB began the construction of a batch of 5 locomotives. The contract, however, did not materialize, so NOHAB eventually sold the locomotives to NSB. 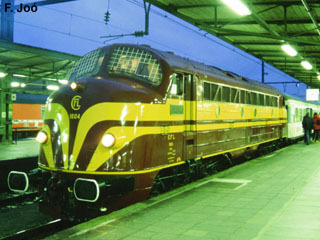 One of these units, later NSB Di3.623, was used again as a demonstrator and brought an order from a country of the Eastern block; in 19631964, 20 units were built for the Hungarian State Railways (MÁV) which became the M61 class (also in Co'Co' arrangement). With a few exceptions, all of NOHAB's streamlined cab locomotives were originally equipped with steam heating and a large water tank typical for the American FP7/9. Only the last few Norwegian Di3's (363033) were delivered with electric train heating, using a separate diesel engine for this purpose, yet later on, most other Di3's of NSB and some MY's of DSB were rebuilt with the same electric heating equipment. Later on, DSB showed interest in a smaller cab locomotive for branch line service with a 12-cylinder engine and of course a smaller axle load. NOHAB took Henschel's J12 construction (2050 class of ÖBB, Austria) as the starting point and added the "traditional" nose and three-axle trucks. This type became the MX class, unique to DSB, although a similar internal construction was also used for the hood locomotive T41 of SJ (Sweden). NOHAB's later locomotives still used EMD prime movers, but departed from the classic cab unit design. DSB's MZ class already had flat cabs, similar in appearance to Australia's "flying bricks." Other EMD-engined motive power built by NOHAB includes the hood units built for SJ and the LKAB mining company. NOHAB's cab units are also famous for their reliability and durability. After roughly four decades in service, many of DSB's MY's and MX's are now in service at private shortlines in Sweden, Denmark and even Germany, others are maintained by preservation societies. 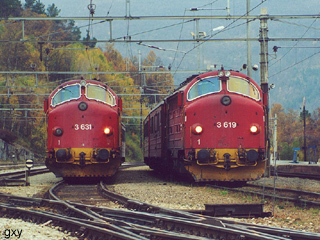 While some of the Norwegian Di3's were already handed over for preservation, additional years of service in Kosovo and Italy are envisaged after the withdrawal of the remaining units at NSB. The Hungarian M61's were, unfortunately, in a less favored situation, but the fact that the remaining units were until their withdrawal much more reliable than other "flagships" of MÁV's diesel fleet and gave excellent service despite maintenance on a "shoe string budget", proves again that EMD created a faithful and virtually indestructible machine. Following the very successful test runs of the U. S. Army locomotive MRS-1 No. 1818, also Belgium favored EMD motive power for subsequent dieselization. 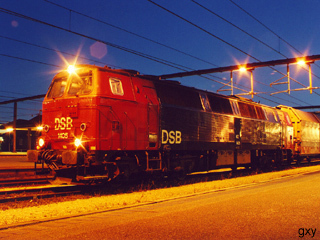 Ordered by the Belgian State Railways (NMBS/SNCB), the AA16 locomotives of AFB (Societé Anglo-Franco-Belge) built under NOHAB's license, are almost identical to DSB's MY class. 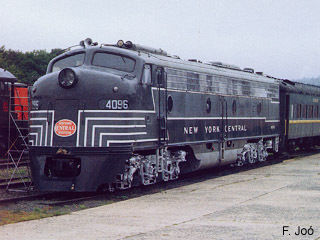 A striking difference in the external appearance of the machines as built was the lack of headlights on top of the nose (later added to some units in many different ways, aside from a pair of red tail lights), which may look unusual to a spectator accustomed to the American EMD cabs. From 1955 to 1957, altogether 44 locomotives of the AA16 design were built by AFB. 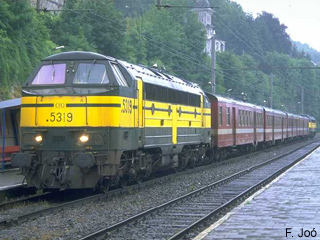 The Belgian classes 202 and 203 (later 52 and 53) were designed for universal and freight service, respectively. Both classes were equipped with a dynamic brake having a 48" fan, while a steam generator was originally only present in the 202 class. The 204 (later 54) class was intended for fast passenger service, hence equipped with train heating and lacking dynamic brakes. While the first four units of the class were built as 204's, the other four resulted from 202-rebuilds. Convinced of the longevity of the GM locomotives, NMBS/SNCB started a rebuilding program in 1979, during which the machines were rewired and equipped with floating cabs. The only exceptions to the rebuild (aside from already condemned units) were 5404, now added to the Belgian heritage fleet, and 5204, now owned by PFT, a preservation society, the latter unit unfortunately still without an intact prime mover and traction motors. CFL's four units of the 1600 series are almost identical to the Belgian 54's; in fact, they are locomotives originally built for Belgium. Their acquisition by Luxembourg resulted from an agreement with NMBS/SNCB, according to which also CFL could provide high-speed passenger service beginning with the new international passenger timetable of 1954. The small number of the 1600's never meant a maintenance problem to CFL, since later on, larger numbers of 1800 class locomotives of nearly identical internal construction were delivered. The AFB locomotives had also a long service life. Gradual retirements began in the 1980's, the first unit withdrawn being SNCB 5405 (retired 1982). The first half of the 1990's saw the complete withdrawal of CFL's 1600 class, although only 1601 fell victim to the torch while the other three went to preservation societies. Most of the Belgian units, after their remanufacturing with floating cabs, made it to the end of the 1990's without difficulties, but the new millennium threatens also them with withdrawal. Seeing the example of the Danish locomotives, it is not impossible that we may also see some of the "floating cabs" on shortlines. Luxembourg's 1800 series leads us finally to the latest offspring of the classical cab units. CFL and SNCB received in the 1960's further batches of locomotives (CFL 1800, SNCB 55 (formerly 205), 62, 63 (formerly 212)) from La Brugeoise et Nivelles which were internally very similar to the bulldog-nosed AFB locomotives  also having the well-known EMD 567 prime mover  but had a more angular external appearance. Altogether, even these six-axled and four-axled creatures, their model designation still AA12/AA16, can be considered distant relatives of the North American F-units. Even if their hey-days are over, most BruNivel units are still in regular service and it is to remain so for quite a while, although with the spreading of railcars and trainsets, their number is also decreasing year by year in passenger service. From the 1950's on, Henschel also offered a variety of EMD export models, among them streamlined cab units. Henschel's catalog listed three possible classes of them; AA8, AA12 and AA16, depending on the number of cylinders of the 567 prime mover used. In 1957 and 1960, Henschel produced three batches of cab units for Egypt. The KK16 built in 1957 was a custom design, a "traditional" carbody with A1A'A1A' axle arrangement and two separate 8-cylinder prime movers, each powering the traction motors of one truck. Later, Henschel cab units showed some departure from the classic design. Additionally to the mechanically driven cooler fans (as opposed to EMD's electric fans on most other export models), also the usual full-height side wall bracing was given up. This became visible in the outlines of a thicker and heavier underframe, and this change made also possible that the top portion of the side walls was somewhat inclined towards the engine room, interrupted by large rectangular machine room windows and air filters. The Bo'Bo' AA12 and A1A'A1A' AA16 built in 1960 already exhibit these features and have an extended length because of the mechanical cooler which was no more placed above the prime mover. Almost coinciding with these batches was the prouction of the J12, a dual flat cab locomotive with a 12-cylinder prime mover known as the 2050 class of ÖBB (Austria), having essentially the same cross-section as the Egyptian AA12 and AA16. The J12 was built in two batches (195859 and 196162) and served as the source for NOHAB's AA12, the Danish MX. The heavy underframe instead of the side wall bracing of previous NOHAB's was also apparent on the latter units as was the presence of a mechanically driven cooler. There is one more interesting custom-built Henschel locomotive which deserves attention: the meter-gauge six-axle TT12 built for Ghana in 1959. This lightweight type, especially equipped for tropical climate, also sports two bulldog-nosed end-cabs, but has recessed engine-room walls, flanked by walkways on each side, covered with a roof. This unusual arrangement had few counterparts in the world; worth mentioning would be GE's single-cab "veranda" turbines built for Union Pacific, or to stick with EMD-related examples, Victorian Railways' N class "dogbones" and Irish double-cab locomotives, though the latter ones do not sport covered walkways. Later on, Henschel also favored boxy constructions and hood units, so the streamlined cab units for Egypt were followed by bigger batches of JT22, the same basic construction then appearing in the JT26's as the ME of Denmark and the Di4 of Norway. With the acquisition by ABB, EMD's competitor and later by Adtranz, a GE licensee, Henschel departed from the builders of EMD export locomotives. As for service and preservation, fate was not too merciful to Henschel's cab units. All the Egyptian streamlined cabs were withdrawn and apparently scrapped long ago, although there is generally little known about these units, including the TT12 of Ghana. Though not a streamlined cab locomotive, the J12 of Austria deserves further mentioning; even if withdrawal is to devour the 2050 class in a matter of years, currently many units are still used for freight service. One machine is on static display in Vienna and another (2050.002) has been preserved as a museum locomotive, now wearing its original green livery and regularly working a pair of rush-hour commuter trains between Laa an der Thaya and Wien Nord on weekdays.